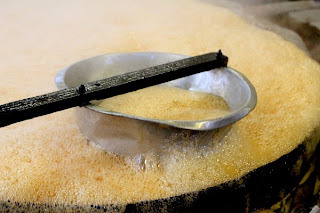 Note from Angela: Living in a place that Sugar Cane does not grow, I’ve never even attempted making pure cane syrup. This is fascinating and an absolutely priceless experience! Thanks for sharing, Alex! 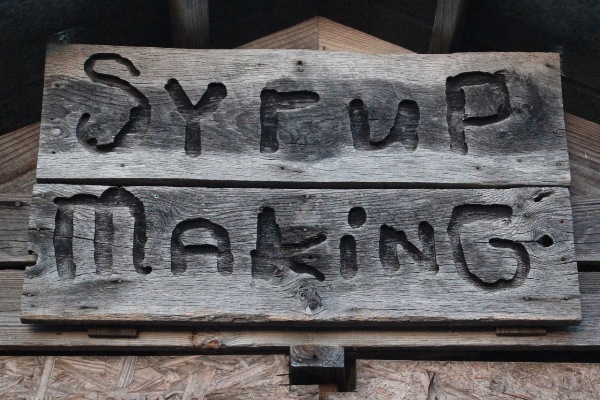 The fair is finally behind me and so is my second year of learning the syrup-making trade. This second year was much more informative and hands-on than last year was. As I often write about learning forgotten skills, I figured that a recap of my week and some details on the process and people might make for some good material. Big thanks to my friend Casey Jones for sharing these pictures! The story is always much more compelling with visual aids! Hang with me…….I’m going to jump around. I’m going to share some of the process and some of the people. It gets long, but it’s Americana at it’s finest. In our community, the county fair is put on by the local Kiwanis Club, of which I am a member. This is our only fundraising event of the year and all of the proceeds stay in our community. 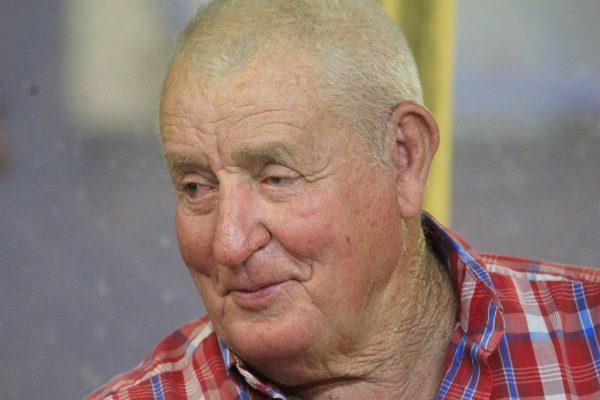 The club tries hard to keep the identity of a “real” fair, making sure to include livestock shows, displays of old farm equipment and other heritage related activities. 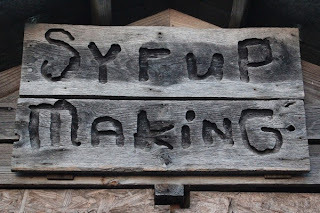 One of those activities is syrup making. As the club gets up in age, the need for younger members to take over certain jobs is becoming increasingly evident. In my time I’ve seen the soap making and candle making exhibits go by the wayside because those artisans passed away. I have committed to not let the same thing happen to syrup. The process began a few months ago when we had someone come in to rebuild our furnace. The years had not been kind to the brick work. A gentleman by the name of Randall generously donated his labor and expertise to the club and rebuilt the entire furnace…. free of charge. Randall did so because he loves to see these types of traditions live on. He later mentioned to me that his daughter had received a Kiwanis scholarship some years earlier as well. I’m sure that helped too ;) A few weeks ago we began scouting the sugarcane and gathering wood for the week. 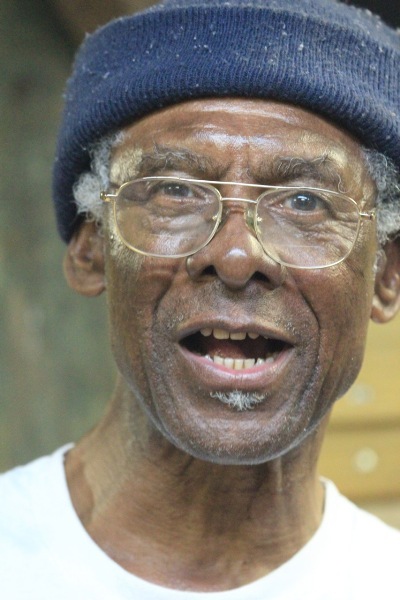 I talked about the time I spent with Mr. Thomas in a previous blog. He is the reason I’m involved with this in the first place. Mr. Thomas is no spring chicken! He’s a good man and very good to take me under his wing and teach me. I hope that I do him proud. With the wood stacked, the new furnace drawing like a champ, we were ready for a busy, but enjoyable week. 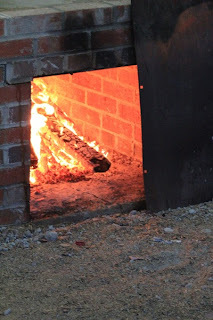 The fire was hot and the new furnace was up to the test! 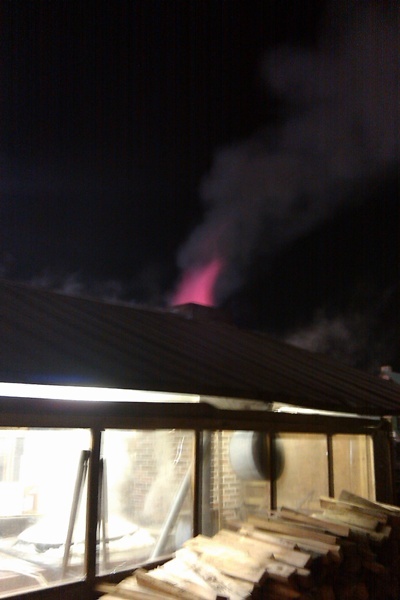 At one point we had a 3 ft flame coming out of the top of the chimney! 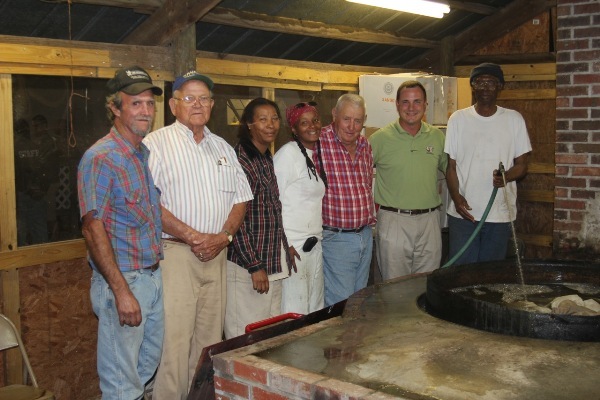 They syrup that we make is pure Cane Syrup. We add nothing….no Karo, no preservatives…. nothing. We even probably let a little bit of dirt make it through to the bottles just so that it’s authentic. 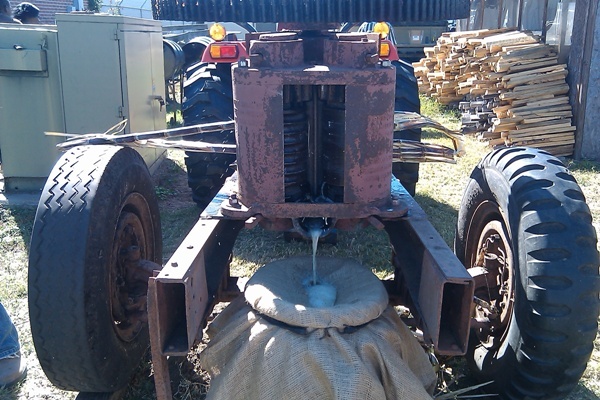 It all starts as we feed sugarcane stalks through a cane grinder, or mill, to press the juice from the stalks. The cane goes in on the left and is pressed between rollers. The spent stalk comes out on the right and the juice flows down into a barrel. That high-tech filtering system that you see is a tobacco sheet, more commonly known as burlap. That keeps out the random pieces of cane and other larger pieces of trash. Once we had 60 gallons of juice, we dipped it from the barrel into washtubs, walked it inside and dumped it into a cast iron pot which is mounted into the brickwork that I mentioned earlier. At that point we built a rip-roaring fire and waited on the juice to boil. The key to cleaning the syrup is “skimming.” As the juice comes to a boil the dirt and remaining trash comes to the surface. At that point we skim it with what is nothing more than an old colander mounted to a stick. The man who is best a feeding the fire and skimming the juice is George. George has been a mainstay at the fair over the years. In fact, he’s an institution in our community. Everyone knows him. Someone asked George how old he was. He replied, “I’m seventy nine this year…… no….. sixty nine…..yeah sixty nine years old.” No one really knows. I’m not sure George knows. I know this though…… George can and does work circles around men half his age. He does it with a smile too. It is always a pleasure to work with George. He has no clue who I am from year to year, but he always lifts my spirits. 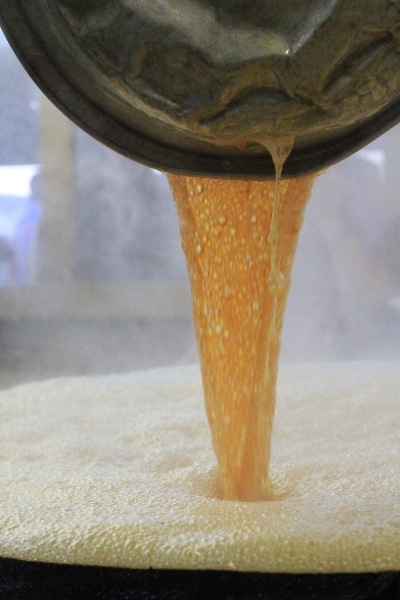 Back to the process…….. As the juice is skimmed those remains are dumped into a barrel. If you wanted to really be true to the old times you would use that too. 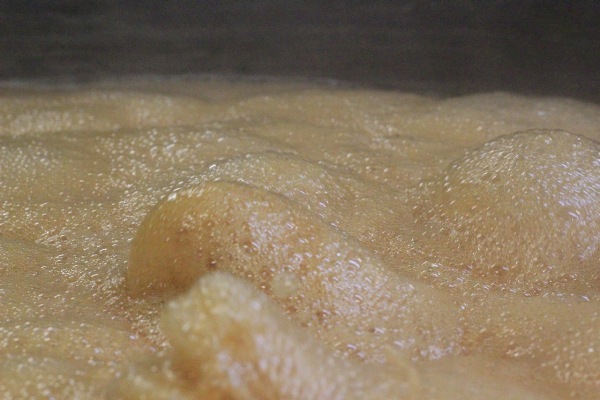 Five or six days later that foul-smelling, fly infested mess that ends up in the barrel becomes what we know and love as…….. Rum. After about three to three and a half hours we’re getting mighty close to having syrup. This is a good point to introduce another of our band of merry men. 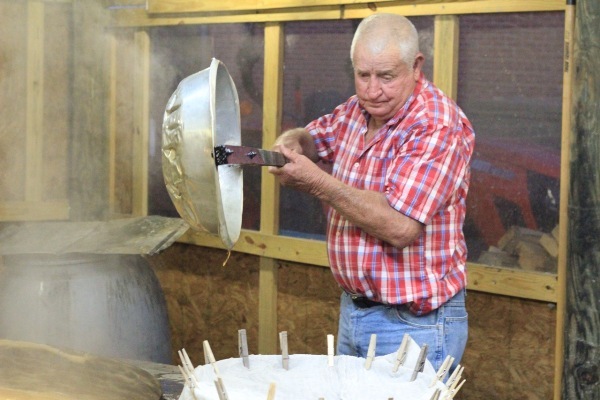 He’s the man who “knows” all about the actually cooking of syrup. He can look at the way it boils and knows if it needs to cool, or if we need more wood. He can watch it bubbling and knows within a few minutes of when it will be ready. Few know his real name, but most everyone knows him as Preacher. Preacher is likely as old as George. Every year he says that he’s not coming back because hes getting too old. I’m told that he’s been saying that for the last 10 years. Thankfully he keeps coming back. The stories he shares about syrup are only a small part of the tales that he has. Everything from “scalding” hogs in those same type cast iron pots to the importance of working hard and keeping a career…..he’s a treasure. One of the funniest things I have ever witnessed is when George and Preacher start squabbling about when the syrup is actually ready. You see, George likes his syrup a little more thin and Preacher likes it a little more thick. It’s a difference in about 10-15 minutes of cooking time. Usually whoever is holding the dipper near the end is the winner. A few minutes later Preacher would begin testing with the dipper. The key to knowing when it’s done is that the syrup will begin “flaking” as it rolls out of the pan. No tools here. It comes up when it looks right! The contraption that you see below the dipper is nothing but a washtub with several layers a cheesecloth held on with clothes pins. 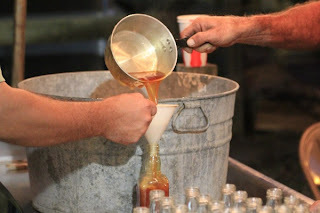 This is the last “filtering” that the syrup receives before it’s bottled. Remember……..this is an exhibit. Otherwise the freaking health department would have us using gas instead of wood and stainless steel pots instead of our beloved cast iron. We’re doing the old way! 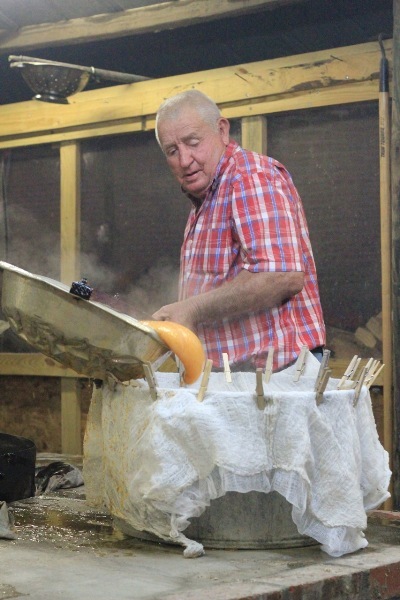 When it’s just right the syrup is dipped from the pot, poured through the cheesecloth and it’s off to be bottled. At this point the syrup is about 400,000 degrees. Not really that hot, but it felt like that when some spilled on my hand during one evening’s bottling process. There is nothing fancy or automated about our bottling either. 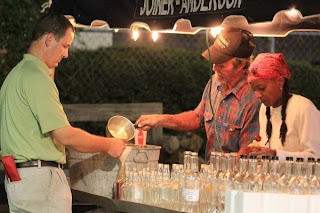 It’s a small pot to dip….. poured through a small plastic funnel…….. into donated glass bottles. The end result is delicious pure case syrup that we could hardly keep in stock. On a couple of nights people were clamoring to buy as soon as we bottled it. As one person put it, “You can’t get that stuff at Bi-Lo!” He’s right! Most of the cane syrup that you get at the grocery store is really only 35% cane syrup. What do they cut it with? High Fructose Corn Syrup. Why would anyone want that garbage on their pancakes? So there you have it! The process of making syrup. What I laid out was just one afternoon/night. We did this all week long and even cooked two batches on Wednesday and Saturday. It was hot. It was sticky, it was smelly. It was hard work. I was pretty sore after the second night, but the soreness worked away on the third day. It’s something to no one really cares to do anymore. Why would they? You can go to the store and get it for a dollar. As the week went along it became clearly evident why we do it, and why I made the right choice in volunteering for this particular job at the fair. Countless numbers of people came by to see the process. Older visitors came and remarked, “Oh, I remember doing this every Thanksgiving!” “I remember washing clothes in a setup just like that!” One bright eyed lady even reminisced, “That used to be my hot tub…… before they even had hot tubs!” College students and young adults came up wondering what the heck was going on. They stopped to watch and hear about the process. If not for us, they would have likely never been exposed to this trade of days gone by. And then the kids…..tasting the sweet fruits of our labor was always a treat for them. The opportunity to work with good-hearted people was a big treat too. Our crew came from all walks of life. All had different concerns at home and at work. All had problems. Some worse than others. However, when we were working this exhibit none of that mattered. We had fun. We enjoyed the fellowship. We enjoyed learning from and teaching each other. Props to James, Thomas, Barbara, Carletha, Preacher and George! Working with them made me a better person. I’m honored to have spent a week with them. I hope I hope to have the opportunity to be with them again next year. This was an excellent post. I live in north Alabama and did not realize sugar cane grew in north Georgia. Nor have I ever heard or seen this many details on the process of making the cane syrup. I knew the canes were squeezed and the juice was boiled down. Other than that, it was all a mystery. Thanks for a post so entertaining that I read it three times, coming back during the day to read it again! Thanks for sharing this. I’m honored. sugar cane is growing nicely down here. We’ll be ready to make some more in the Fall! @Practical Parsimony – I am actually in Southeast, GA. Cane grows very nicely here :) Glad you enjoyed the post. @Shreela – It’s not as thick as you would think when it’s hot. It thickens very quickly upon cooling though. You can’t waste any time dipping and bottling it.